Wasting no time the film begins as something causes a rupture to crack a tunnel across Tokyo Bay. Water is pouring in. The government is mobilized and the scientists think it's volcanic in nature. That goes by the wayside when a creature is spotted. The experts dismiss reports but the sighting of a giant tail out of the water. What transpires from there is a battle between humans and this evolving beast for control of the country. 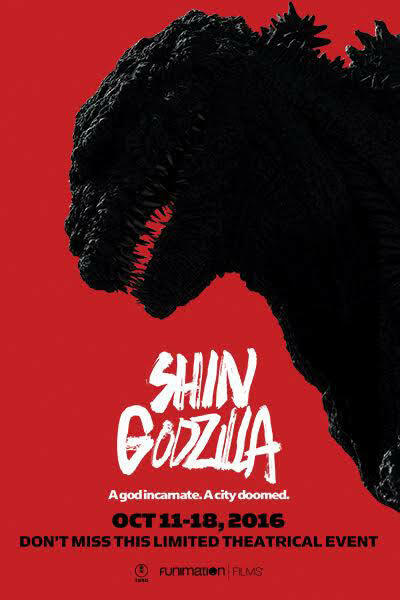 Harkening back to the dark brooding original film, SHIN GODZILLA is a dark meditation on man vs nature and how governments react to threats. This monster, which changes appearance through the course of the film as it grows, is not the lovable man in suit from most of the films in the series. This is a spot on force of nature that is akin to the original or the 2014 American version. The story here is largely new. While there are references to things in other films (the music cues are all there) this is a new world. There have been no Godzillas in this film. It is effectively a restart from scratch and we are better for it since we don't know what will happen next- I'm not going out on a limb when I say almost nothing here is anything you've ever seen before. The film is framed as the story of the government attempting to stop the creature. What do we do? How do we react? How do we keep those pesky Americans out of things? The film is, like the first film, a scary monster on the loose film as well as social commentary. The original reviews pondered if the commentary would play in America and elsewhere since it is at times so Japanese specific with how the government jumps into action, but frankly one gets the sense this maybe how thing might work elsewhere. Sometimes specificity breeds universality. Additionally if you hated the lack of real characters in that earlier film you'll find way too many good ones here. Sure they are scientists and officials but at the same time they do have personalities. This film is a masterpiece of action and monster plotting. The film for the most part starts and goes straight on. The only thing that I find wrong with the film is that after a breathless first 25 minutes the film slams on its breaks as the monster disappears and government tries to figure out hat the hell just happened. There then follows about 20 minutes of exposition which is completely necessary but leaves you feeling short changed. I'm sure it will play better the second, third and fifteenth time through. As for the visual effects, they are masterful, some of the best in any Godzilla film. The creature was created via a mix of CGI, puppets and men in suits. The blending is nigh on perfect with only two shots, neither with the monster not looking real. I desperately want to go into details and reveal what happens but that would be unfair. All of you haven't seen the film and to reveal the things that had me with my mouth open and mumbling to myself is unfair. This is one of the best films of the year. Its one the truly great horror films because like all horror films they are working on more than one level and this film has many of them. The film plays in US theaters October 11 to the 18th in special screenings arranged by distributor Funimation. For more details, a list of theaters and tickets go here. And do see this big because it will blow you minds.